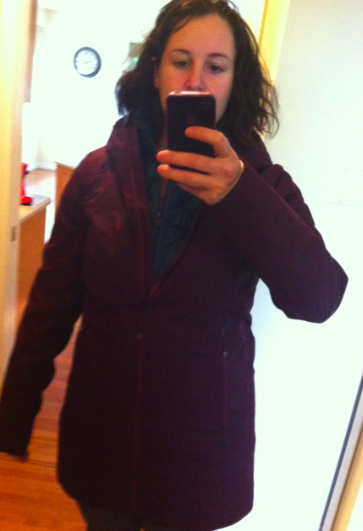 Well, I did not expect to fall in love with this jacket but I really, really love it. The color is amazing in this fabric. I’m a bit torn though on fit. This is my TTS 10 and fits very comfortably in the arms/shoulders and torso, even over a hoodie, but I think its a bit short on me and slightly snug around my hips so I definitely want to try on a size up to see if that corrects that fit issue without making the top half big. 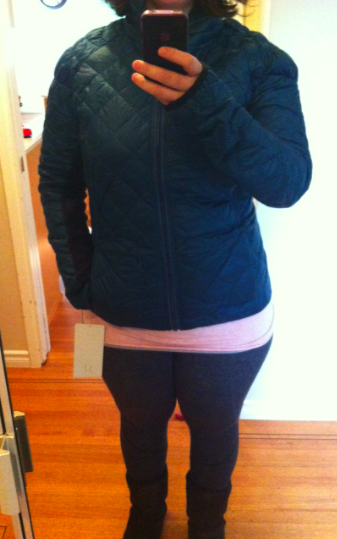 I’ve heard mix reviews on the fit of this jacket and I think if you are bustier or have muscular arms you may have fit issue with the top half and not the hem, if you are bottom curvy like me you may have fit issues around the hips. Also, I’m kind of surprised this is 650-Fill count. It doesn’t feel super warm, it feels light as a feather (pun intended). I think for running purposes it is the right amount of insulating without becoming unbearably warm. For outdoor casual purposes though I wonder if it will provide enough warmth. 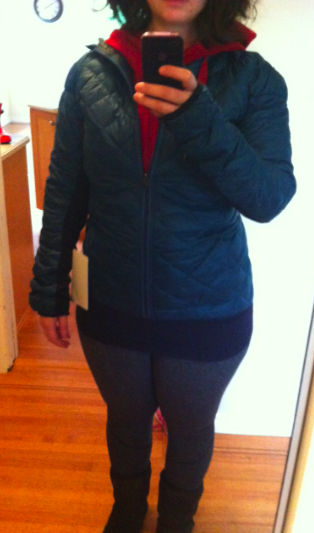 I’m going to pick up my running again in the next few weeks (now that I have outdoor winter running gear I’ve been motivated) so it will definitely get use that way but I wonder about casual wear usage which is what I’m wanting it for. I’m expecting this to be an especially cold winter in Vancouver so I’d like to have something a bit warmer than just a rain coat. I tried this on over an Every Yogi LS, Every Yogi LS with Carry and Go Hoodie, and Every Yogi LS under a Define and the jacket is comfortable over all of those different combinations. 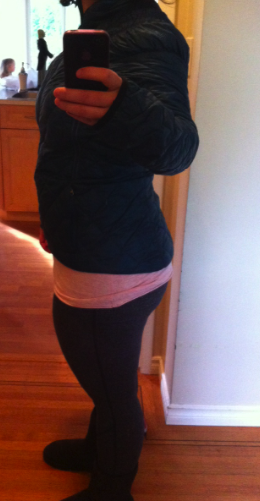 I also tried it on under my Right As Rain Jacket (with a hoodie on underneath) and it was quite comfortable having both layered underneath. This jacket is seriously thin and compact. Something to consider if you absolutely hate the 3X A Lady Jacket but where hoping to get this years version of the Apres Piste/Apex/Podium Jacket. What do you guys think?? 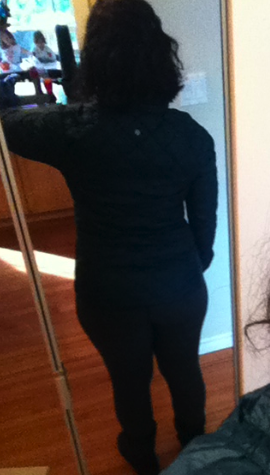 Is it worth sizing up for to get a better length and fit around the hips? Do you already have this jacket and have worn it casually in a cold climate?? "Intuition Sweater Wrap, The Newest Wunder Unders, True Bliss Pants, Sit and Be Still Pants and More"
"Mixed Pictures of the Latest: Clutch Coat, Turn Around Jacket, Intuition Sweater Wrap"